There are few places on the planet where you can explore a reef by glass-bottom kayak one day and glide through a jungle canopy on a zipline the next, or start a day having breakfast with gray whales and end it with tequila tasting at sunset. Los Cabos is one of those places. See below for our top 10 picks to help you design your perfect trip. 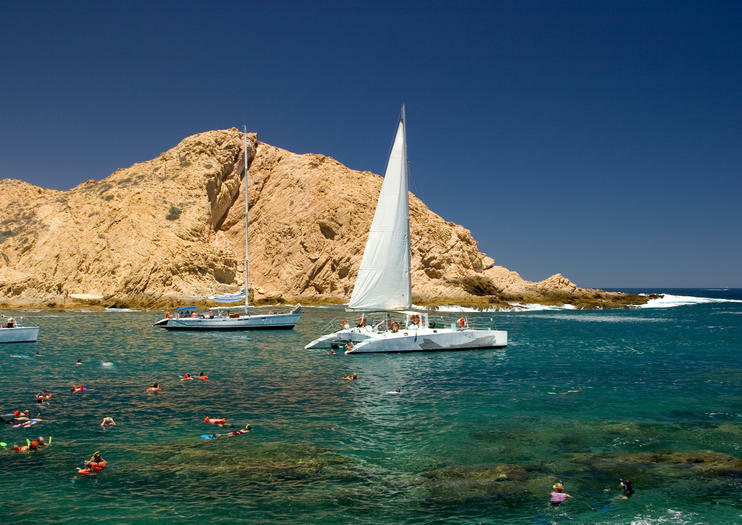 Experience Cabo San Lucas’ wild side on this family‐friendly snorkeling cruise! Sail upon the crystal waters of Chileno Bay with expert guides who offer insight about the surrounding area. At the diving location, don your snorkeling gear and hop into the water to spot brilliantly colored coral and tropical fish. Maybe even see a passing whale pod! Your trip includes an open bar and a sumptuous lunch. Enjoy a combination of natural and cultural offerings with this unique 6-hour Los Cabos tour. Begin your day riding aboard a glass-bottom boat to the landmark rock formation known as El Arco, watching schools of tropical fish swimming beneath you as you go. Back on land see a glassblowing demo at a Cabo San Lucas glass factory, then travel along the spectacular Tourist Corridor to San José del Cabo where you´ll taste tequila and embark on a sightseeing walk through the historic city center. Soar over the dramatic curves of desert canyons and drive a powerful ATV on off-road trails on a 5-hour Canyon Canopy Adventure from Los Cabos. Glide along suspended steel cables while absorbing the unspoiled scenic beauty of the landscape, then drive through with ecological habitats on a modern ATV vehicle. Satisfy an appetite for adrenaline on this adventurous and active tour. Feast your senses on the explosive flavors and cultural delights of Mexico on a 3-hour culinary walking tour of Cabo San Lucas. With a professional guide from Juan More Taco food tours, discover local foodie hotspots and traditional dishes while exploring the vibrant downtown district of Cabo San Lucas. Sample classic favorites like tacos and quesadillas while gaining valuable insight into the culture, traditions and folklore of Mexico. Receive personalized attention from your gastronome guide on this small-group tour, limited to 12 people. Set out across desert landscape on a thrilling ATV adventure in Cabo San Lucas. Depart Los Cabos for G-Force Adventures Park and board a luxury ATV for an incredible off-road drive through sand creeks and canyons en route to the white sands of Margaritas Beach. Follow an expert guide and learn about local flora along the way. You'll even have an opportunity to visit with the park's rare white lions. Discover the cultural and historical highlights of Los Cabos on a fascinating 6-hour tour from Cabo San Lucas. Ride a glass-bottom boat over the crystal clear waters of the Pacific Ocean; marvel at the dramatic beauty of Los Cabos Arch and see sea lions basking in the sun at Land’s End. Then, taste tequila and watch an exciting glass-blowing demonstration before perusing the bespoke boutiques of downtown San Lucas. Feast upon the explosive flavours of an authentic Mexican lunch and conclude with an exploration of the town’s impressive colonial architecture. Discover the natural splendor and diverse wildlife of El Arco on a 3-hour kayak and snorkeling tour from Los Cabos. Soak up the sunshine as you follow a knowledgeable guide to the iconic rock formations of El Arco on kayaks, greeting a languid colony of sea lions as you paddle past. Gaze at a transient tableau of tropical fish through your glass-bottomed kayak and submerge yourself in the shimmering seawater when you snorkel near Pelican Rock. Conclude your enchanting excursion as you kayak past Playa del Amor (Lover’s Beach), and absorb the amorous atmosphere of the secluded spot. Set out on a relaxing and informative sunset sailing cruise off Los Cabos. Board a luxury yacht for a 2-hour evening excursion, watching the sun slowly disappear below the horizon while listening to music and enjoying an array of drinks and appetizers. An expert crew will regale you with facts and history about the area as your boat makes its way smoothly across the sea, taking full advantage of the changing natural light reflecting off the water. Don't miss the illuminated sights along the coastline as you go. Departure time is dependent on time of sunset. Toast the setting sun in Los Cabos with a sunset cruise, followed by a tequila tasting and taco dinner, during this 5-hour excursion. Feel the gentle sea breeze as you ride aboard your vessel for a special sunset sail with an open bar. When you return to shore you’ll taste some of Mexico’s finest tequilas and learn about the history of this iconic Mexican spirit. Cap off your evening with some tasty tacos. A guide, 2-hour open bar on the cruise, taco dinner, tequila tasting and round-trip hotel transport are included.